Do We Still Need Machines to Do the Work So We Have Time to Think? It’s noble, and inspires us technologists to create better machines to do our daily monotonous work so we have time to think about more noble efforts, more serious problems to solve, and become better humans. The problem, I think, is that while we’ve succeeded in creating machines that do the work giving us the opportunity to think, we still don’t. It takes effort to think, and a lot of us just don’t want to take that effort. Further, since our new smart machines provide an endless stream of mildly interesting information, games, or even ‘IT administration’ activities like downloading apps, cleaning up messages, reading detailed logs, and other mundane activities, we have ample opportunity to do a new kind of time-wasting work that fills up any time intended for us to think, while at the same time giving us an excuse not to have to think because we were ‘being productive’. Unlike my dog. For her, she LOVES to learn new tricks and she enjoys thinking hard and figuring out what I want her to do. Teaching her tricks is mentally exhausting for her because she has to think, but she loves it. I love it, too, because I have to think to always be one step ahead of her to reward her, guide her, and when we’re both thinking towards the same goal, it builds our relationship. I wonder why we waste these “think opportunities”? Is it because our problems are too big? Na. Is it because we are afraid of the companionship we will build together? Maybe. Is it because we’re exhausted? Probably. Or, is it simply that the machines we’ve built give us unprecedented access to information and ideas but fail in the one primary purpose that these machines were invented in the first place? Did we lose sight that that these machines were built so we actually have time to think? Is it now that after all this time we realize that quote was wrong…or at least incomplete…that it’s not about the machine but about the experience the machine offers? It’s not the machine’s fault we’re still not thinking. Rather, it’s the user experience those machines deliver that fail in achieving the true goal. We need time to think. To become a better version of ourselves, to build a better version of today. But thinking takes effort that not everyone is up for. Then, at the end of the month, just like a personal trainer, our machines help us look back at all we accomplished…and how much we actually did think. What do you, well, think? I thrive on being creative. I love creating music and words, and I have been known to wonder out loud how awesome it would be to have a job where all I do is focus on being creative. I quickly point out how poor I could be, but I would be happy…I would be creative! If I look back on 2013, what did I do? I created very popular user experiences, I wrote articles and traveled the world educating users how to get more out of what we delivered. Inventing at IBM is one of my most creative moments at IBM. This year I was fortunate enough to have 11 patents issued in 2013. I only mention this to encourage you to be creative in your work…to think of how you, too, can improve the world around you by being creative in whatever you do for a living. Whether we like it or not, our workplace is where we can have the most impact on others because it’s where we spend the most if our time. How about you? How do you stay creative in your workplace? Isn’t “Horrible UX” A Bit Harsh? Last time I wrote about my experience at B&H web site and how the “Horrible” user experience eventually saved me $500 and cost B&H $2000. 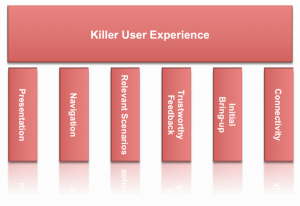 As a refresher, here’s how I wrap my head around user experience: User Experience is composed of six themes: Presentation, Navigation, Relevant Scenarios, Trustworthy Feedback, Initial Bring-up, and Connectivity. Each theme acts like a door. Each door needs to be interesting enough to the user that the user takes a small risk to walk through. The responsibility for the product (and the designer) is that the door through one theme sets the user’s expectations for how the user will experience the next theme. B&H’s web site had a great presentation. The home page is easy to look at, has some nice graphics reinforcing what it offers, and I start to build trust that they know what they’re talking about after scrolling down the home page. Right next to my iMac was “Add to Cart”, and what makes it an A+ is that instantly after I added it to the cart, I was surprised by being offered free software and discounts on photo editing software I was wanting to buy but didn’t even know they sold. I saw my items being added to the cart, saw the total, and I was pumped! I was completely sold not only on the product I was buying but in the way that B&H led me through the transaction with expert reviews, peer reviews, and fast performing “Added to Cart” response. I had no problems getting started with the web site, but there was a small point of confusion where it didn’t remember my ID so I couldn’t get to my ‘wish list’ as simply as I expected. No biggie. In the end I was led through. I moved between devices and since it offered a user account, I could connect from anywhere and the web site offered instant chat and other features I could have tried. …and then it told me it couldn’t connect to the check-out process. Now I actually think this is on purpose, but I can’t think of why. 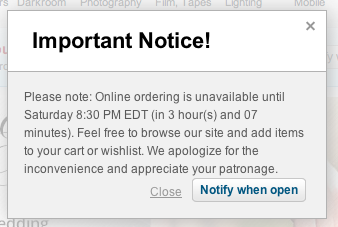 They might as well offer a “Buy from Amazon Instead” button on the dialog above. I did envision one possibility: I imagine a dimly lit basement in the B&H warehouse downtown New York. A young, but strong intern stands in the basement of B&H with sweat rolling off his back as he turns a heavy crank. His muscles are sore, covered in grime, and quivering in exhaustion. Next to him is a two-story rusty mechanism with 12′ gears slowly turning while creaking and complaining at each crank. Above is a sign that reads, “Turn To Activate Your Internet Checkout Subroutine”, and since he’s the only guy strong enough to turn the mechanism, he needs a few hours each Saturday to rest. Other than that possibility, I just don’t get it. This experience does strongly validate the importance of the WHOLE user experience. Companies can invest a ton of money in how a product looks, navigates, that it is relevant to the user, gives feedback, and is simple to get started. However, if the back-end fails at the most crucial point, if the whole reason for the web site’s existence is off-line, everything ounce of investment was a waste of money and the whole user experience is a failure. Even worse, it lost a customer (at least for that day). I think that’s why I called it a horrible user experience. How about you? What do you think the most important part of a user experience is? I own a recording studio, and while I’m quite happy with what I’ve recorded and released, I knew it was time to upgrade my studio computer as well as recording software. After many months of research, I decided that my core computer would be a new iMac with 27″ display. What? This is the Internet! It never closes! I was hoping to get on the last truck so it would ship that day, but since our band was playing that evening, I had to leave it for later. An hour later, as we were setting up, we started talking and I was reminded about Apple’s refurbished section. “Of COURSE!” I said, “I get refurbished iPhones and iPods from Apple!” I couldn’t believe I hadn’t checked that option out. When I got home later that night, I went to the Apple refurbished store and found the exact same iMac for $1529!! I was pumped $170 less! I ordered it right away (after clearing the iMac from B&H’s cart). I then searched forums and found that for recording work, the 8GB of memory should be enough for what I want to use it for, and if it wasn’t, I could add it later. I also found I could add AppleCare later if I wanted, and then found I could get Lightroom for $113 on Amazon…only $30 more than the bundle. In the end, I saved nearly $500 and didn’t have to hit my budget limit. I was thrilled! B&H? They lost $2000!!! …and a bit of trust. To the Seller: If you have a web site that brings in money, NEVER put it in maintenance. And if you do, bring in a backup, or at least keep it running during a high traffic time. To the User: If you encounter a bad user experience, use it as an opportunity to try something different. You may end up a lot happier with what you find and it may save you time and money! How about you? Have you ever had a similar experience like this? How many times have you truly been surprised at a user experience? Not in the “I can’t believe they shipped this piece of junk”, but in the “I’m giddy with delight…I want to bear-hug the lead designer of this project!”? It just happened to me at the Musical Instrument Museum in Phoenix, Arizona. As I described in my design session “How to Craft (and Measure) a Killer User Experience”, a user experience goes far deeper than just shiny objects and fancy artwork. 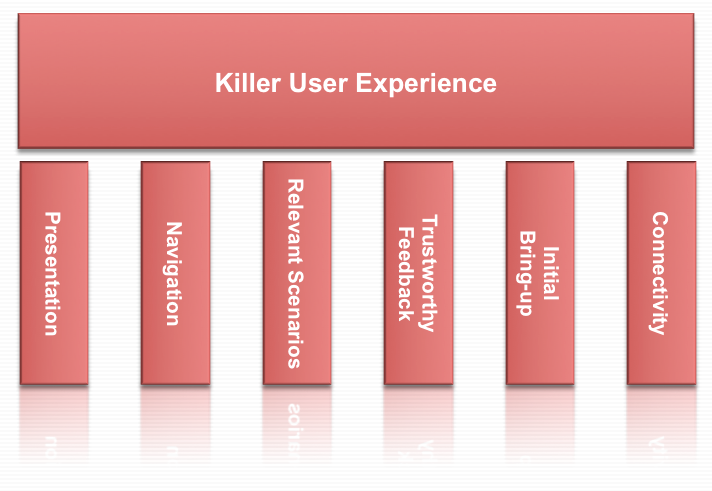 User Experience, at least the way I’ve come to understand it, includes six themes, or doors, the user walks through (Figure 1): Presentation, Navigation, Relevant Scenarios, Trustworthy Feedback, Initial Bring-up, and Connectivity…and they are all essential to create a killer user experience. My wife and I walk into the MIM, and pay for our tickets. Unlike the Louvre, the audio guides (earphones and device) come with the ticket. A small thing, but nice! We walk to a nearby gallery filled to the rafters with guitars…my love language. 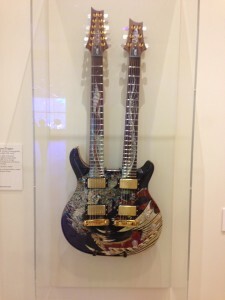 After studying my favorite (Figure 2, a Paul Reed Smith Double Dragon), we walk up stairs to the museum. 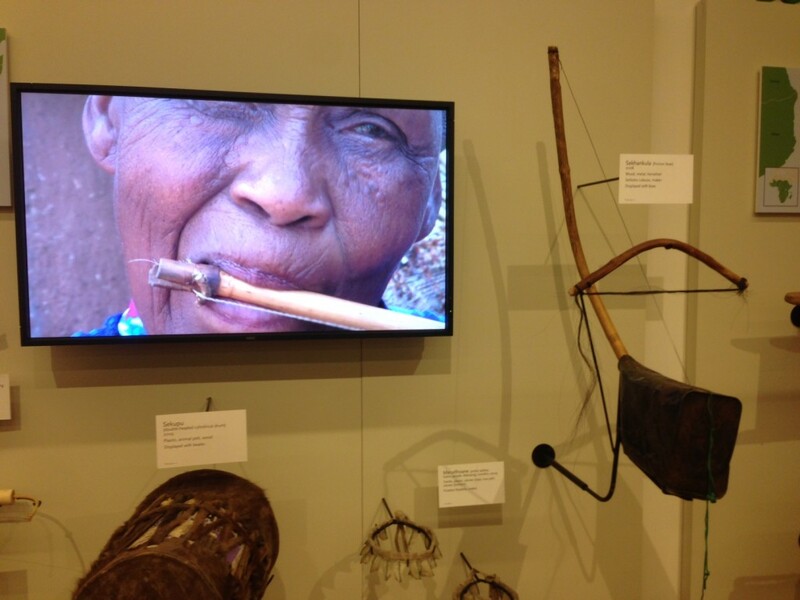 We put our headphones on, and as we walk to the first display, we suddenly start hearing what these instruments from 19th century Africa sound like. The audio connects seamlessly and synchs so we can hear, and see on the TV how they play the instruments as well. I can’t tell you how delightful that was. No numbers or channels to figure out, no fancy touch-screen to palm and screw up, nothing. The mere act of moving closer to the TV automatically immerses us into the musical culture right in front of us (Figure 3). Their attention to detail was impressive. For example, as I walked towards the display, the music faded in at a smooth, natural rate…reinforcing that this whole experience should be a leisurely stroll through the music of the world. As I walked away…or as the device switched between two nearby TV audio signals, it calmly faded, and once out, the next audio faded in. This reinforced that the designers knew experiencing the music was the top focus, rather than just making sure the technology worked. I actually expected an abrupt beginning and end, but instead I was gently waved goodbye by the display I was leaving and warmly greeted by the display I was approaching. As a side note, it was almost erie to take my headphones off and hear complete silence..even though hundreds of people were strolling throughout the museum. What the designers at MIM figured out is how to provide an effortless connection to experience musical instruments from around the world. I mean effortless…walking closer to a display activating the audio? With nothing for me to dial in? And not having to share audio with others or have 198 displays blaring its own audio for all to hear? 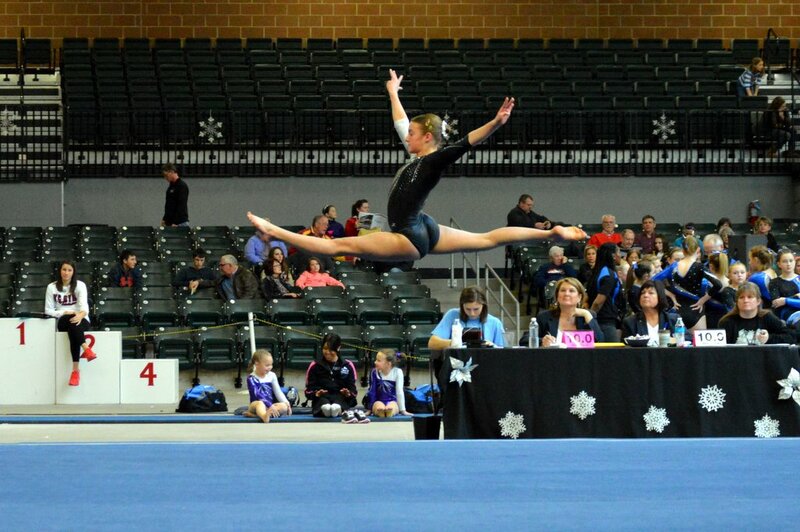 Yes, effortless. Was it perfect? Nope. But pretty darn close. There were a few times that I could not sync to the TV. 98% of the time the device worked flawlessly, but when it didn’t I did feel a bit at a loss. Since there were minimal controls on the device (start, stop, volume), the only thing I could try was to press stop and start in hopes it would re-synch. When that didn’t’ work, I’m sure I looked a little funny doing a little 2-step as I moved farther away then closer to the display in hopes it would synch up 🙂 I even found myself waving the device towards the TV and wondering if the ‘front’ of the device should be pointing directly at the TV or not. One other minor issue had to do with the “Relevant Scenarios” and “Navigation” user experience themes. Being a musician, I wanted to play these awesome instruments…like these from South Africa. (Figure 4). Figure 4 – These were screaming for me to play them! The problem was, I wasn’t told about the “Touch-It” lounge downstairs until we found it later. It would have been awesome to have a little “Touch-It” logo next to the display label for that instrument…so I knew instantly I could either play it or something similar to it later on. I realize that user experience is usually referring to software interfaces, but I think we all agree that more and more interaction with our environment does not have a detailed screen to look at. The designers at MIM should be awarded with their awesome, relevant, delightful, and in the end, killer user experience. How about you? 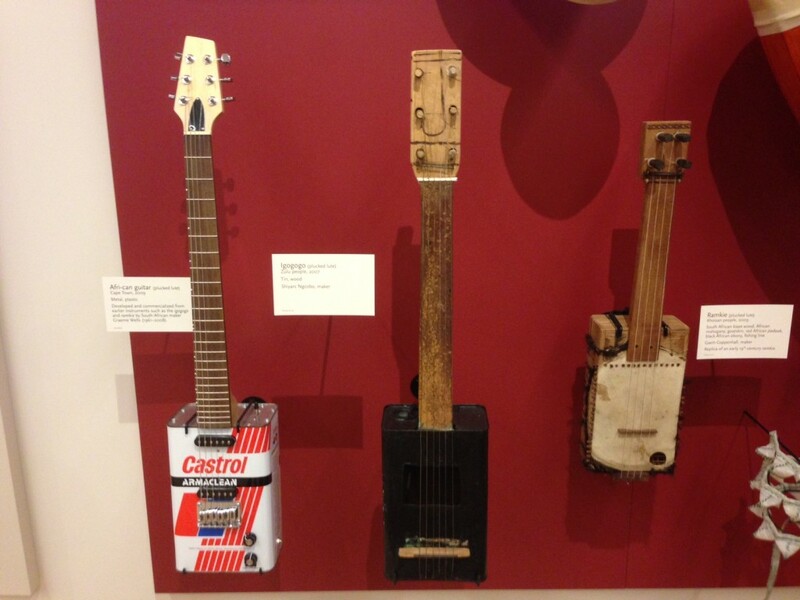 Have you visited the Musical Instrument Museum? What did you think? He explained that while humans think we can hear lots of different things at once, when it comes down to it, we really focus on one thing…and if a composer isn’t thinking about the “main thing”…and crafting the music to make the “main thing” stand out, then the listener might focus on something else and not really hear what the composer thinks is most essential to that moment in the song. Anyway, AC/DC’s Back in Black. That song has one of the best intros in any song. If you listen, the intro quickly moves from string mutes/high hat, to the guitar riff, then adds bass and off it goes into the vocal. But listen again. The “main thing” is actually the snare. Notice how the guitar riff stops so the snare can breathe…there’s nothing interrupting that glorious “SMACK” as the snare (and guitar) set the tone, beat, intensity of the whole song. The “Main Thing” in Your UX may also surprise you. It may force you to dim, remove, or alter the flow of your designs so that the user is delighted with how easy your interface is to use; not because there are so many awesome capabilities to choose from, but because they instantly see what they need to focus on. For example, in our newest PowerVC product, we have all kinds of cool capability, pretty gauges, data, and graphics giving the user much-needed information on how to manage their virtual machines. However, when users are first starting out, the “main thing” is none of that…it’s simply a “Plus” icon guiding users to add hosts, storage, and network. Nothing else should have the users’ focus. I truly think we’re only tapping the surface of what this simple question could do to our user experience. I’m excited to see how much more we all can improve our products by asking this single question. What’s the “Main Thing” in your user experience? I know. Seems stupid. “Greg, you’re an idiot”, you say. Well, hear me out. That usually gives us a much better solution that not only solves their immediate problem, but also may solve many related problems. We have a chance to meet or even exceed their expectations since the solution is just better. I’m starting to think that taking the extra effort to not only understand our users’ goals, but also think of how to accomplish them from a unique perspective that’s different than everyone else in the market, combined with using new, innovative technology, can truly deliver a killer user experience. What do you think? What products have you used that don’t meet or exceed your expectations because they completely blew you away because you were in awe at how incredible the product was? It’s not very often we start on a brand new product, but when it does, it gives the whole team a chance to craft a killer user experience. While I’ve mentioned several times how I go about designing a killer user experience, but, when it comes down to it, its success truly depends on how focused our development team, executive team, and user research team are on delivering an outstanding user experience. 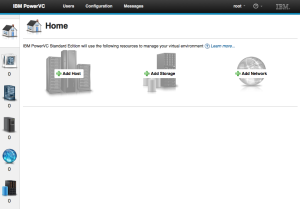 I am thrilled with the UX of our newest product: IBM PowerVC. Because not only did we do our best work on the design, the entire team was driven to deliver the best user experience possible. Is it perfect? Nope. But based on the time we had and the resources we had available, I think it’s pretty great (and so do the customers who have previewed it…which is our ultimate goal). The design team iterated over and over to polish, change, alter, restart, and finish a fantastic design that the development team could deliver. The development team was relentless in its pursuit of outstanding UX. We had healthy debates about the best way a widget should behave, what tasks were most relevant to our users, even how the artwork should look. And lets face it, without awesome developers, even your best designs won’t benefit anyone. The executive and product management team was the fuel that drove this relentless pursuit of great user experience. Even for us in the design community, it’s tempting to take the easy way in order to make a deadline, but this time there was a constant mantra “Focus on the UX” from the very top. Take a peek, and let me know what you think. Oh, and here’s a question to leave you with? How do you say thank you to your developers when they deliver your designs?